I'm new to Arduino and am working on a project with my son. We are using the LillyPad USB board (schematic) to drive a bunch of LEDs (LED Datasheet). Our project is based loosely off of the 'Turn Signal Biking Jacket'. Is this ideal? Would it make more sense to connect the LED-chain to Vcc and have the return line connected to a single output set to LOW (to turn on the lights)? If we were to have 3-4 of these LED-chains on at once, do I have to be concerned with total draw on the microcontroller? If you know the forward voltage of the LEDs you can easily do some calculations. With 11 LEDs in parallel on at once that would be 0.02 * 11 = 220mA. That is far more than the 25mA an IO pin is able to supply, so you will damage the Arduino doing it like that. Now your Arduino doesn't care about the current - all it sees is the MOSFET. 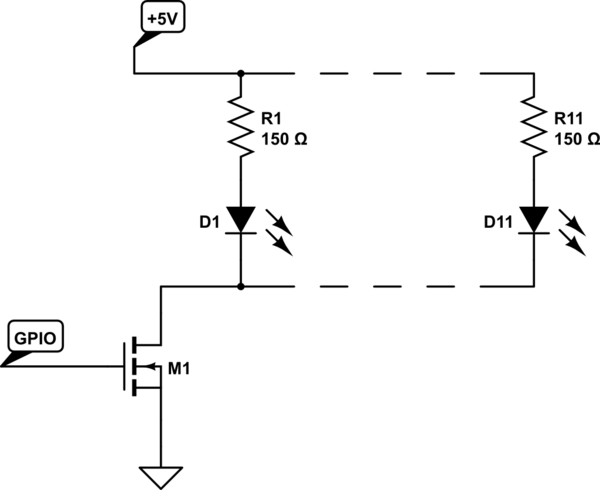 Since the forward voltage is now double you use a smaller resistance to set the current (R=V/I, where V is 5-2Vf). Not the answer you're looking for? 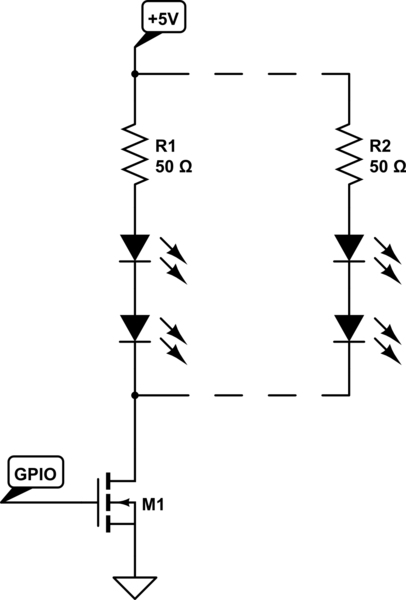 Browse other questions tagged pins electronics current voltage or ask your own question.